Starting with the 4.0.3 release, vBulletin will feature single sign-on integration with Facebook Connect. What this means is that, should you choose to enable this feature, users of your forum will be able to connect their vBulletin account with their Facebook account, and then log-in using the Facebook Connect button. It also provides the option of simplifying the registration process, so that users can register on your forums by simply logging in through Facebook Connect. By default, Facebook Connect single sign-on and auto-registration will be disabled. Going forward, we have many plans for expanding the capabilities of the Facebook Connect feature set. However, for 4.0.3 we have decided to keep it simple and only implement this basic functionality. We did this because, in addition to adding more Facebook Connect features, we also hope to implement additional log-in integrations such as OpenID, Google, Yahoo, etc. (similar to the vBNexus product). And the current implementation of FBConnect provides a framework, both in the code and in the UI, for moving forward on these plans. The following is a step-by-step guide to configuring and using the Facebook Connect feature. 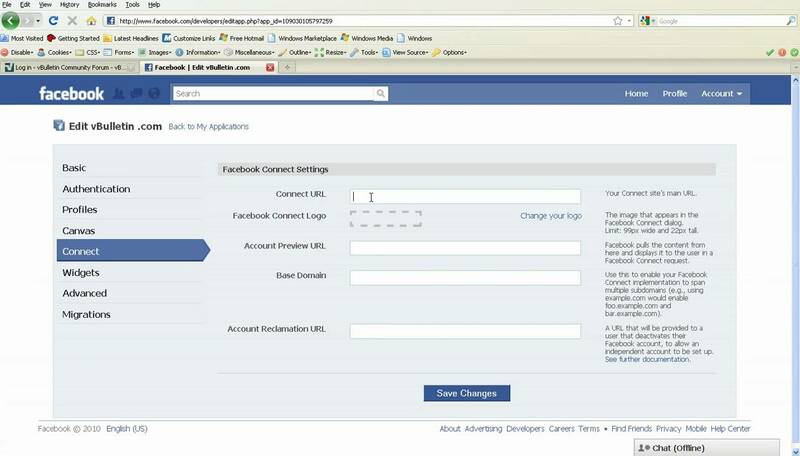 If you do not already have a Facebook account, you will need to create one to get started. We have also provided a short video tutorial to compliment this guide. Stay tuned for more information on upcoming Facebook Connect features. In the "Account Reclamation URL" enter your forum root plus "/register.php?do=fbdisconnect"
The updated guide for 4.0.4 and higher is located here. Anybody know whether it works with vB5?